Limp-limbed, I’m lolled on the couch just starting to reflect on all the amazing experiences my family and I shared over the last two weeks. My wife was born in Scotland and quite of few close family members still live in the country. She’s wanted to take the kids to meet the Scottish family every year since the tots were born. This was the year everything finally fell into place. Over half a year ago, when tickets to the UK plummeted, we decided to pull the trigger on 4 tickets. Not more than a few days later, one of Anna’s cousins, unaware that we had already purchased tickets, asked us to come out for her wedding party in March. It just so happened that the date of the party was smack dab in the middle of our ticket dates. Not only would we be in town for the party, but the entire scattered family would be as well. Coincidence? I choose to believe it wasn’t. To make our lives easier, we invited my 16-year old niece to help with the kids. Party of five, bound for Scotland. Direct flight to London and head to Anna’s cousin’s flat for two days of capital tourism and travel acclimation. Drive to Edinburgh with a night stop over in the English medieval gem Durham. From Edinburgh, it is a short drive to Fort William, Scotland, which would be our base for the rest of the trip. After a week in Fort William, it was out to Glasgow to catch a connection to Heathrow, then back home. So after months of anticipation, we finally left in mid-March, on the first day of the year we would have turned on the air conditioner. Later, Phoenix. The red eye out of Phoenix was blessedly uneventful. We arrived in London bleary-eyed but excited. Traveling with my son (who is wheelchair bound) provides its own unique challenges but it’s also not without advantages: we were fast tracked through passport control. In record time we were out of the airport, speeding through London with our rented VW Transporter on our way to cousin Alyson and Ayo’s cool and comfortable flat right on the Thames in Battersea. We spent the night munching on Indian delivery and planning our London site seeing day. Tuesday was an uncharacteristically sunny day. Because of the wheelchair and our lack of time, we opted to use the ubiquitous London black cab (equipt with wheelchair ramps). At our first stop, the London Eye, we were relieved to find a short line and were blessed with a relatively empty compartment. A short jaunt over the bridge (where a horrific terrorist attack was to occur just a few days later) by Big Ben and Westminster Abbey (stopping for a quick pint) , down Birdcage Walk with its host of golden daffodils in bloom, and we were at Buckingham Palace. We then walked up to Piccadilly Circus for a slow lunch at a historical pub. I had hoped to take the kids to the British Museum but ran out of time, so we cabbed it up to King’s Cross station so the kids could see Platform 9 3/4 and the Harry Potter store. Izzy is now the proud owner of a genuine Hermione wand. From King’s Cross, we called it a day and cabbed back to Battersea, left the kids with Megan, and had a nice quiet meal with Alyson and Ayo. Wednesday started with a 6-hour rainy drive up to picturesque Durham. This bridge laden medieval city is built around an enormous 11th century Norman Castle and Cathedral. Replete with hidden alleys and cobblestone streets, remote Durham manages to maintain a charm that is usually quashed by an over enthusiastic tourism industry. After we left the kids in the hotel to veg out following the long drive, Anna and I wandered through the meandering streets and took in the crisp cold night air. Perhaps the most prominent feature of Durham is the student body of Durham University, who were frantically parading the streets in outrageous costumes. My CAMRA app pointed us to a great little pub, we had a pint and called it a night. The next morning we took the kids up to tour the cathedral. They were most intrigued with the pensioner volunteer guide who boasted a conversation with Daniel Radcliffe during one of the Harry Potter shoots on the cathedral grounds. About two hours into the three-hour drive to Edinburgh fatigue set in. The kids were hungry, it was a bit cold, and Edinburgh seemed forever away. We opted to stop into the suburb of Musselburgh to for lunch and visit one of only three pubs in Scotland to win CAMRA’s national pub of the year. Unfortunately, the only place we could find food was a Tesco cafe (imagine a Target with a small cafe). But the pub was great and soon we were rejuvenated and headed toward the elegant Waldorf Astoria in Edinburgh (thanks hotel points!). The boys stayed in and relaxed while the three girls did some evening site seeing. In the morning, the boys woke up early and did some site seeing while the three girls relaxed. The weather was miserable, so Harry and I ducked into a cafe for breakfast and went to pick up Anna’s mom (“Lola” to the kids) at the train station. After a brief visit to the castle, we all met up for lunch and then piled back into the car for a 4-hour scenic drive to Fort William. The house we rented was on the outskirts of town and required a somewhat focused white-knuckle drive through a small 200-year-old tunnel. We arrived, and then, just like that, the house was full of family members that I’d never seen in the same room. Anna’s mom, sister, brother-in-law, uncles, aunts, cousins: family from England, Fort William and other places in Scotland, and three corners of the states. It was a poignant reunion. The next morning, Anna’s sister and I walked six miles along the Caledonian Canal (the path is aka The Great Glen Way) into Fort William. Later that night was Anna’s cousin’s wedding party, which happened to also fall on our 16th wedding anniversary. Sunday was a lazy day. Izzy and Bonnie (Anna’s sister) went to church with uncle Iain and later met up with us at the grocery store. Bonnie and I wanted to cook for everyone that day but we had not quite worked out the menu. We ended up cobbling together fajitas and Mexican rice. As soon as we got home, the whole crew showed up. 18 people altogether. Every single member of Anna’s maternal grandmother’s offspring, complete with spouses and children thereof. That rented house in Torcastle, just beyond the tunnels, was a home for a few brief hours. The next day we slept in. The plan was to visit some waterfalls up at Glen Nevis and meet the cousins for a coffee at an inn on the glen. We accidently went to the inn first, which resulted in a bizarre episode that I will discuss below. After figuring out where the falls were, we made out way there just in time to get driven back into the van by pelting cold rain. Rather than just leave we decided to wait a few minutes to see if the rain would pass. It did. That night consisted of dinner with the extended family. Adam (the brother-in-law) dusted off his damsel in distress “but I can’t pay the rent” bit to much applause. Tuesday morning brought snow. Giant dime sized snowflakes, which initially didn’t stick but eventually dusted the landscape like a cheap north pole mall display. Lola and Anna wanted to have some kidless time with the aunt and uncle, so I opted to stay with the kids. At some point, I decided it would be a good idea to dress the kids in too much clothing and set off on a snowy hike down the canal to a cafe a mile down the way. So we set off in the snow. 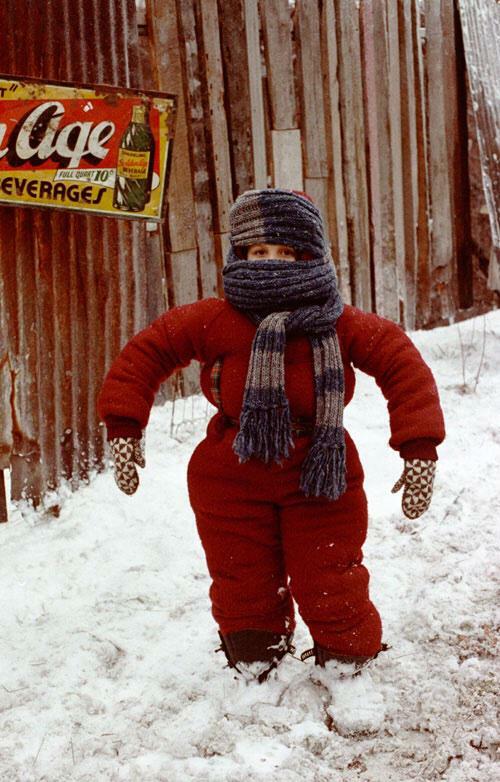 Izzy looked like Ralph’s little brother from A Christmas Story, donned in at least two too many layers. My niece and I managed to get Harry and his wheelchair through a narrow turnstile and up the steep muddy bank to the canal where I enthusiastically marched them towards the promise of hot chocolate topped with mountains of whip cream. Unfortunately, one mile turned into two, and then three. At one point it started raining and everyone’s “rain resistant” jackets aptly demonstrated their distinction from “waterproof” jackets. I was beginning to get worried about Harry so I jogged him down to the cafe, where Anna turned up just in time for me to run back and find Megan and Izzy. Izzy had to dry off her pants in the cafe’s bathroom hand dryer but, in the end, the promised hot chocolate and aforementioned whipped cream mountains were happily consumed. The fates rewarded me with a fresh cask of Deuchars Caledonian IPA, a beer I fell in love with over a decade ago but have not seen on cask since (excluding my attempts to clone it at home). I had somewhere between 5 and 7 pints before the day’s end. Anna and I ended up back at the same cafe (but then magically transformed into a “bistro” for dinner service) that night. I mentioned a note about a bizarre episode that began a day prior at Glen Nevis. It was at dinner at the cafe/bistro that the story began to take shape. We pulled up to the closed Ben Nevis Inn around 2 pm a day prior, under the false impression that the waterfalls we were looking for were within walking distance. It happens the Ben Nevis Inn sits at the trailhead of a trail that summits Ben Nevis, the highest peak in the UK. At the trailhead, a map of the Ben Nevis trail is posted. At the map stood a barrel-chested mid sixty-year-old man, decked out in what appeared to be old school hill walking attire. Hoping the map would point me to the falls, I walked up and scratched my head. “Not very clear, is it?” the man commented. We talked a bit but he didn’t seem to know where the falls I was looking for were. However, he did point out the “zig zags” (switchbacks to Americans) and noted that the portion beyond the zig zags was “narrow and dangerous.” We talked a little more, we wished each other luck and I watched him slowly but confidently set on off up the path. Everyone knew it would snow that night. There was no doubt there would be even heavier snow on the mountain. It wasn’t until the next day while Anna and I were eating dinner that I thought about him again. Lola had liked a post on facebook about the Ben Nevis rescue team recovering a man who had “spent the night on the mountain” and was in a severe hypothermic state. I joked to Anna, “wouldn’t that be crazy if it was the same dude.” So I googled it and a thumbnail with a picture of the man popped up. I thought it was kind of funny. But then I read the article. He had phoned a friend towards the top of the mountain to tell them that he was making for an emergency shelter. He never made it. He fell and laid in the snow for hours, covered until the rescue team happened upon him. He was 71, frostbitten, hypothermic, and not likely to survive. I commented on that rescue post that Lola liked. For the next two days, I checked the news regularly hoping there was something more about the story but there was nothing. I was genuinely worried. He seemed like a nice guy and an experienced (albeit severely under equipt) walker. Finally, two days after I learned about the story, I was sent a facebook message by his daughter who had seen my comment. She wanted to tell me that he was out of ICU and was going to survive. Good news. We slept in again on Thursday. By the time we were headed towards Urquhart Castle at Loch Ness it was already lunch time. We stopped into an upscale hotel restaurant in the fantastically charming canal side village of Fort Augustus. This turned out to be the best meal of the trip, owing largely in part from oysters from the nearby Isle of Skye. After our unrushed lunch, we arrive at the ruins of Urquart Castle just before they were closing. We ran quickly through the ruins and were back in the car within a half and hour, a little annoyed and unimpressed. As we drove back to the house, the weather broke just as the sun was beginning to set. We stopped at the Spean Bridge commando memorial for a bunch of pictures. A few hundred meters drive down the road, we stopped at the cemetery where Anna’s grandparents are buried. Both the kids seemed to understand the somberness of the occasion, punctuated by Izzy standing at the grave of her namesake. Many families have a member that, because of their interests and preoccupations, is the keeper of family history. I am that person in my family. Maybe it’s my love for history or my own tentative history to my past (having been adopted my father), but, for whatever reason, I consider myself charged with keeping a fire that will burn out with time if no one tends to it. Luckily, I became that person before my grandmother passed a few years ago and was able to record a trove of history about my mother’s family. The fire of the McIntosh line of my family will burn for generations because of the work I’ve put in. Eight years ago, after I was laid off from the law firm, I set out to spend my severance period sinking my teeth into family history. Part of this venture resulted in an epic east coast genealogical excursion. During this period, while in Florida at Lola’s house, I picked up a book off her coffee table and started reading. The book was about the Isle of Eigg, the tiny Hebridean island from which much of my wife’s family hails from. Generations of that side of the family, lived, labored, and died on that small oddly shaped rock. Lola spent her summers there and uncle Ian was born there. What started out as a mild interest in the island, transformed into a genealogical obsession. After reading the book cover to cover (a feat that, while many copies were scattered across the family, had never been accomplished), I began a correspondence with the author. A few years ago, Anna and I were flying to Vegas when she pulled out an issue of National Geographic Traveler from the seat back when I noticed that Eigg was on the cover. That Christmas, I bought a large print of that photograph, which is now prominently displayed in our home. As soon as we bought tickets for our UK trip, I started thinking about Eigg again. Getting to and from Eigg this time a year is difficult. There’s a ferry but it only runs a few days a week and leaves almost as soon it arrives, leaving the tourist no time to explore. This meant I had to find and hire a private boat to ferry us to and from the island. I’ll spare the reader the details but after three days of delays due to weather, we finally had the green light. Eigg for Thursday, weather looks good. Getting to the port town of Mallaig from Fort William is a breeze. There’s a train that starts in Fort William and ends in Mallaig. You’ve probably seen the train that runs the track in the summer. It’s the steam engine used as the Hogwarts Express in the Harry Potter movies. 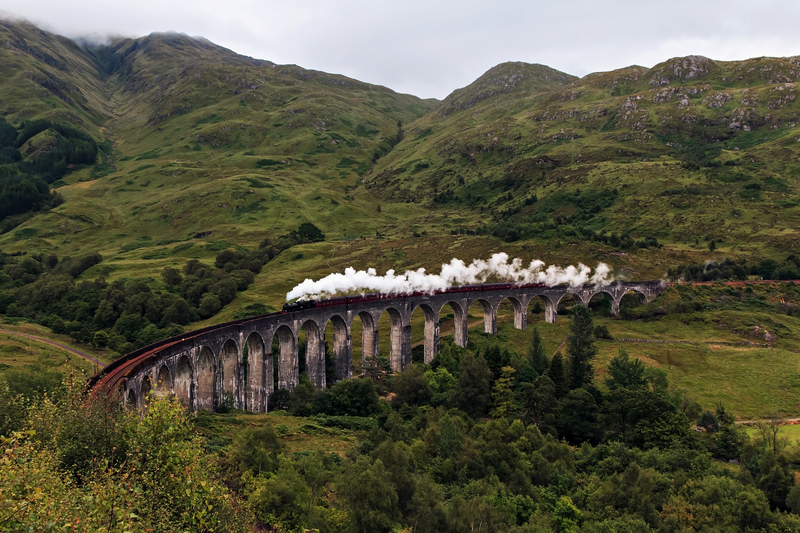 The iconic Glenfinnan viaduct is also featured prominently in the movies. The train ride was scenic. We arrived in Mallaig had some locally baked treats and boarded our boat. In no time, we were sailing toward Eigg on the calmest and sunniest days in months, water as smooth as glass. Our boat captain was an amiable local who had sailed on the water outside of Mallaig for 30 years. He was barely older than me. Upon arrival at the pier in Eigg, we (Anna, the kids, Lola, uncle Ian and I) were greeted by two men: John, the current owner of the old family homestead and Charlie, “taxi driver” (or, a dude with one of the few cars on the island and some spare time). In the US, our houses are designated by numerical addresses but in the UK, many houses, especially in the country, have names. There’s a house that looms large in the lore of my wife’s family: Craigard. The modest dwelling, one of a handful on the east side of the island, is the focal point of the family’s island history. Lola spent her summers there. Uncle Ian was born there. The family lived in that home for nearly 150 years, and quite possibly much longer on the same plot of land. The house is visible in the picture of Eigg above. Just right of the white lighthouse, in the middle left of frame. I’m a little unsure how the family lost the house because I’ve never had the nerve to ask. Every time the subject comes up, there’s a distinct bitterness and hurt concerning the circumstances involving its sale. It’s been owned for a few years by John, one of the men who met us on the pier. John graciously let us visit the property. I got the impression that John may have been a little apprehensive about some far-flung tourists wanting to come see his house but after a few minutes, whether he just warmed up or realized the deep connection Lola and Ian had with the place, he was eager to share details about improvements and ask questions about things he was curious about. We budgeted three hours on the island. Nearly half of that was spent at Craigard. I could see the flood of childhood memories dance across Lola and Ian’s faces. We spent time talking about certain bushes, door latches, and recently discovered WWII-era graffiti in the attic (attributed Ian and Lola’s uncles). Clearly updated, Craigard still was very much the place the two of them spent their carefree summer youth. Dougal, John’s Falkor-esque golden retriever amused the kids while we soaked up the sun and talked about Craigard’s secrets. It’s most interesting secret sat unceremoniously on the garden wall. John picked up a seemingly unnoteworthy rock and told us how a recent rain and a perfect ray of sunlight revealed long hidden writing on the stone. He had an archeologist come and look at it and send some pictures off to some experts. It turned out the writing was runic and probably 8th-century. Just sitting there for 1,300 years. The jury was out on the authentic translation but John happily accepted a proffered vulgar explanation. As our three-hour window was rapidly closing we made our way to Kildonan, site of a 7th-century massacre of Saint Donan and his followers, the ruins of an 11th-century church, and the island cemetery, where Ian and Lola’s uncles and grandparents are altogether in a family plot, likely on top of family members of generations past. The weather on Eigg is not usually pleasant but during our visit, it was magnificent. Standing there at that cemetery in the breeze and the sun, overlooking the bay with its the snow capped mountains running the length of the eastern horizon, I’ve never experienced a more peaceful scene. Isolated, beautiful, ancient, poignant. We returned to the boat at exactly 3pm. Two unfortunate germans who had missed the return ferry the day before hitched a ride back to Mallaig with us. It was a quiet ride back. We were all tired and happy to take in the great weather. Back in Mallaig we had a lackluster meal, boarded the train and sped home in twilight, drowzy and satisfied. For our last morning in Fort William, we visited Anna’s cousin Nicola, who works at the ski resort in town. After a gondola ride up the mountain, we had lunch, played in the snow, and headed back down the hill. We stopped by Lola’s sister house to say good by to the aunts and uncles and then headed to Glasgow. After a long and tired drive to Glasgow, we arrived at our hotel. Anna is usually pretty good about picking our accommodation but this place was a dump. Just awful. So I got on the phone and found out a much cleaner chain hotel closer to the airport. We set the kids up at the hotel and met with cousin Carol for Indian. We saw three foxes on the way to the restaurant, had a solid meal, went back to the hotel, and fell asleep immediately. I love Indian food but it can mess with me. Our alarm woke me out of a dream in which I was riding a flying carpet time machine through Edinburgh with Benjamin Franklin to meet up with Dolly Parton. In hindsight, I think maybe my sub conscience was beckoning me back to America by dream casting two of the most American personalities. Our flights back home, while extremely long, were uneventful. Childhood family trips are when cherished lifelong memories are made. I have little doubt that my kids will grow up with the fondest memories imaginable of this trip. But just as important, I hope this trip instilled in them a sense of 1) identity: understanding their roots, and how deep they go, and 2) enchantment: understanding that there are places in this world that can fill the soul with a sense of wonder and magic that eclipses the saccharine manufactured enchantment offered by commercial experiences. Enchantment is worth pursuing. It does not often come to one accidently. It’s my sincere hope that the seeds of enchantment were sown with this trip and that one day those seeds will bloom in my kids and my niece and spur them on to adventures of their own. As for me, I’ll be forty soon. Seems like a good reason to hunt some more enchantment of my own.